We were on the wall at the Siladen Timur dive site, on the reef that surrounds the resort island of Siladen (site of the Siladen Resort and Spa). As we drifted with the gentle current, my guide pointed into a small concavity in the reef wall, completely ringed by hydroids. 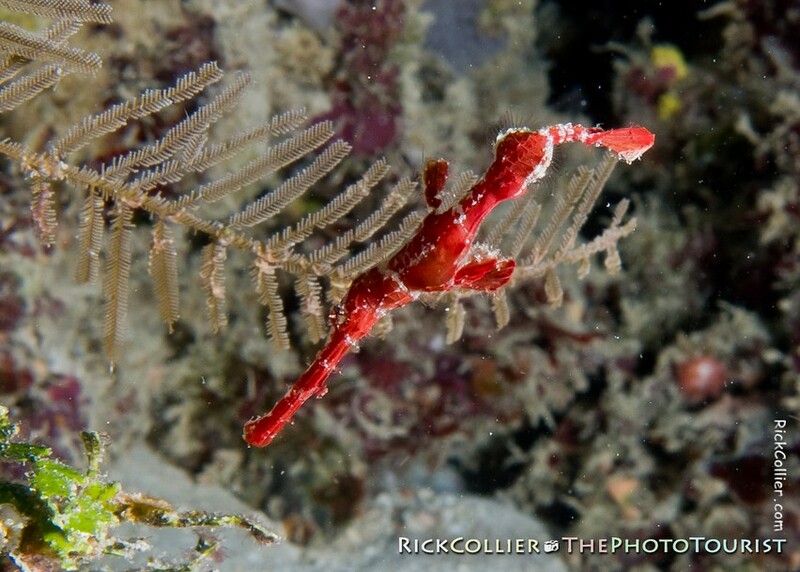 Peering into the depression I saw a red robust ghost pipefish, maneuvering to hide along the reef wall behind the hydroids. As I watched, the small ghost pipefish moved over a hydroid branch, moving in to the side of the small depression where he was hiding. Soon, he would be back against the reef wall and effectively out of my camera’s angle of view in the small gap. He seemed to speed up as I pushed my camera forward through the hydroids and snapped the shot. (The object in this frame that looks like a tan fern is actually a stinging animal, related to jellyfish.) I collected several hydroid stings to my hands and wrists … but I got the shot. This entry was posted on Wednesday, April 6th, 2011 at 23:25 pm. It is filed under thePhotoTourist and tagged with Bunaken, Bunaken National Park, dive, diving, ghost, ghost pipefish, hydroid, Indonesia, North Sulawesi, photo, Photo Tourist, PhotoTourist, pipefish, red, reef, robust, robust ghost pipefish, scuba, Siladen, Siladen Timur, the Photo Tourist, thePhotoTourist, tourism, tourist, Underwater. You can follow any responses to this entry through the RSS 2.0 feed.